In a week where the West clashed with Russia, a string of air strikes on Syrian targets has rocked the international community. Missiles streak across the Damascus skyline this morning. THE UNITED STATES, France and Britain launched retaliatory strikes on the Syrian regime a week after an alleged chemical attack on an ex-rebel town, despite warnings from Russia. On Saturday April 7 the Syrian American Medical Society (SAMS) and Syria’s White Helmets rescue force jointly say more than 40 people have died in a “poisonous chlorine gas attack” in Douma, the last opposition-held town in Eastern Ghouta near the capital. Blaming the government, they say there are “more than 500 cases” of people with “symptoms indicative of exposure to a chemical agent”. The Syrian Observatory for Human Rights, a Britain-based monitor, does not confirm a chemical attack. It reports however at least 70 cases of respiratory difficulties among civilians after regime air strikes, saying 11 people had died. The regime and its key ally Russia deny any chemical attack. The following day, US President Donald Trump tweets that there will be a “big price to pay” after a “mindless CHEMICAL attack”. Moscow warns Washington against carrying out a “military intervention on fabricated pretexts” which “could have the most dire consequences”. On Monday April 9, US ambassador at the UN, Nikki Haley, says Washington is determined to “see the monster who dropped chemical weapons on the Syrian people is held to account”. The USS Donald Cook – a guided-missile destroyer – leaves Cyprus, moving within easy striking range of Syria. On Tuesday April 10, the Syrian army puts its airports and military bases on alert, the Observatory reports. The global chemical weapons watchdog, the Organisation for the Prohibition of Chemical Weapons, announces a fact-finding mission to Douma. On Wednesday April 11, Trump tells Moscow to be prepared for a retaliatory missile strike. “Get ready Russia, because they will be coming, nice and new and smart!” he says on Twitter. But the White House says later that no final decisions on a response have been made. The Russian defence ministry dismisses footage of attack victims as “yet another fake” and a staged “provocation” to justify Western intervention. On Thursday April 12, Russia announces the whole of Ghouta is all but under pro-regime control as more rebel fighters leave Douma. “Of course, the chemical attack is what pushed us to agree” to a withdrawal, a top rebel official tells AFP. President Emmanuel Macron says France has “proof” the Syrian regime used chemical weapons and would respond. Russian President Vladimir Putin calls Macron on Friday April 13 to warn against any “dangerous actions” with “unpredictable consequences”, the Kremlin says. Russian Foreign Minister Sergei Lavrov says Moscow has “irrefutable” evidence the alleged attack was staged as part of a “Russophobic campaign”. The Russian military points the finger at London. At the Security Council, UN chief Antonio Guterres warns the spiralling tensions could lead to a “full-blown military escalation”. 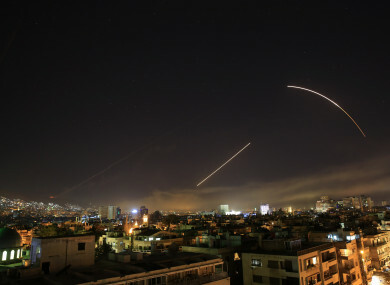 Several consecutive blasts are heard in Damascus at 4am (1am Irish time), with airplanes overhead and smoke rising from certain areas, an AFP correspondent says. At the same time Trump announces he has “ordered the United States armed forces to launch precision strikes on targets associated with the chemical weapons capabilities of Syrian dictator Bashar al-Assad”. Britain and France confirm their participation and their allies line up behind the action. More than 100 cruise missiles were fired, a significant number of which were intercepted by Syrian defences, Russia’s defence ministry says. There were no victims among the Syrian civilians or military, it says. Syria’s government denounces the strikes as “barbaric” and Iran warns of “regional consequences”. Russia also calls for an emergency session of the UN Security Council. Email “How did it come to this? A timeline of the Syrian chemical attack to today's air strikes”. Feedback on “How did it come to this? A timeline of the Syrian chemical attack to today's air strikes”.